I recently won a copy of this book and although it is not my usual ‘genre’ it did sound appealing. The words : “You can live your whole life not realising that what you’re looking for is right in front of you” boldly standing out on the back cover got my interest. Also the book begins on a graduation night in Edinburgh in the late 80’s. I was a student at this time, so thought I may be able to relate to the book because of this. 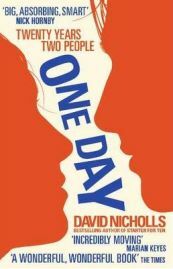 It is written by the author of ‘Starter For Ten’ and cites commendations from authors Nick Hornby and Tony Parsons. I figured that if you like those authors, then you may be interested in this book, and after reading it I believe my initial thoughts are correct. The story begins on 15th July 1988. Emma Morley and Dexter Mayhew (Em and Dex) are celebrating the night of their graduation in Edinburgh.